Best Free Weather Apps For Android is just amazing, that’s why I got 10 of the latest and the best from google play store. 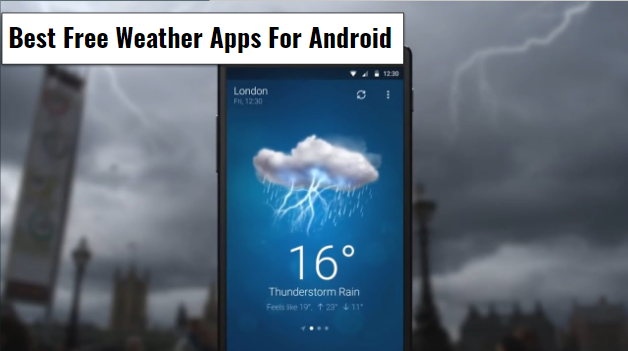 Weather apps are one of the most essential apps for Android users all around the world. I can’t imagine anyone with an Android device and he/she doesn’t have a weather app, most Android devices take it as far as to even put a weather app as a system in-built app so that you don’t need to worry about downloading or subscribing for any weather app. Now, you don’t have to worry, the weather apps on my list of Best Free Weather Apps For Android are totally free, no paid app or anything like that. So all you have to do is click the download link that will be provided below each weather app that I will introduce into my list. and you will be seconds away from having a free and fully functioning weather app for your Android device. So, first on my list is this beautiful weather app, simply named Weather, and it has over 1 million downloads on google play store so far. Now, if you are searching for the perfect weather app that can pretty much do everything, and when I say everything, I mean, search your current geographical location and receive weather conditions and forecast for that location to your Android device, then this weather app is the app you need. Basically, like most weather apps out there and the ones on my list below, an internet connection is required to constantly receive weather Info. Most weather apps nowadays on google play store require a stable internet connection to function properly, so keep that in mind. This app predicts weather condition on various channels, humidity, temperature, wind, precipitation, dew point, water, pressure, visibility, sunrise, and sunset, and many more other channels not mentioned. With your screen display, you can witness as the weather app animation comes alive. Now it doesn’t matter if you switch off your data for a bit, once you turn on internet connection again, this app will detect it and automatically reload and keep you posted of all newly updated weather conditions. This app is just 9.7MB in the installation size. Weather Forecast is way better than the above app, in things like more features, fast response to the data connection and new locations. The more you understand how this app works the better for you, There are widgets available for this app, you can easily put up a widget on your Android device’s home screen to quickly view and get weather Info. Your widget automatically updates once the app does so, simultaneously. A notification will be available from this app to your smartphone’s notification bar. This app can give you weather prediction for up to 7 days. It can also give info hourly, daily, weekly and monthly. This app is totally free, just 11MB in the installation size, also just 10 million downoads on this particular app. Pull out your google maps app and search for your location, you can also use the app to search for different locations and their weather forecast. AccuWeather is here to give you an accurate prediction of the weather condition at your location. AccuWeather has alerts that can help to keep you apprised of the ongoing weather condition. The weather condition, in general, doesn’t just change to whatever it wants to. Notifications are available in this app, you can easily get notified of any new updates to the weather condition. This app has over 50 million downloads, pretty much higher than the previous weather apps on my list of Best Free Weather Apps For Android, although now, the size of this app isn’t certain, you might need to be connected to a stable, constant internet connection to enable you to download this app, but the size won’t be large, so expect something less from what you’re thinking. Get a strong internet connection for this free weather app that is simply amazing. Do you like beautiful and colourful widgets, are you a fan of notifications getting pinned on your notification bar, so that anytime you swipe down your notification bar to view your notifications, you’ll see them pinned and set for you. Well, this app has it all. Now, the measurement of your temperature, either in degree Celsius or Fahrenheit, will be determined by the time zone of the city you live in. So, before doing anything with this app, you’ll need to first fill in your Country and then the city you live in. The widgets from this app also come with some of its digital clocks, so that time zone is going to be very important. Now, there a lot of features here I might not start listing one after the other, but this weather app works okay, just like any weather app should work. So all you got to do is click the download link below and try this app out for yourself, just 10MB. This Weather & Widget – Weawow weather app is one of the best weather apps you’ll ever see, and surely one of the best weather apps on my list of Best Free Weather Apps For Android. An accurate and very detailed weather app that predicts weather conditions days away and still keep you updated about them every time, every day, till they come and go. This app is available in many languages, over 30 in number, so you don’t have to worry about translating any default language to your language, all you got to do is to click on the settings option and change to your prefered language, this, therefore, means that this app is available to everyone around the world, regardless of your Race. All this fun for just a 4.5MB sized app that can bring colour and beauty to your Android device and help define the word smartphone. WeatherBug is one of the most popular weather app on google play store today. This app once won The Best Weather App Award 2016, that just goes to show you how valuable and honoured I’m to have this app among my list of Best Free Weather Apps For Android. New features that you haven’t seen in other weather apps are surely available in this app, we got weather news, weather forecast, wind forecast. Always check your current weather condition, although there will be notifications available to keep you posted at all times, no matter where you are. There are three maps in this app, just hope you don’t get to use it when you do download this app. We got maps like Satelite maps, interactive map and weather map, all these maps are to help you know where in your country the weather condition is going to change and probably if the condition poses a threat to people around, you can warn them. The size of this app is yet to be ascertained. You remember how I said I had seen the best weather app ever, well this app just tops it all off. This app is without a shadow of a doubt the best weather app on my list of Best Free Weather Apps For Android. This app can literally do anything for you, you need to check the time? this app has well-decorated clocks that are willing and ready for you to use them. Now, I’m just going to lay out some amazing features about this app, I’ll start with the fact that this app doesn’t really need you to manually search for your location, this app automatically detects your location, provided your Gprs is on. This app has one of the coolest widgets out there, all for just 11MB in the installation size. So looking at Real-Time Forecast Weather App just makes me smile, because I know what this app is capable of, tons and tons of amazing features, widgets, weather channels, Weather alerts, clocks, and even weather radar. Now, you can set the app to send you new updates and notifications hourly or daily, You can also check some amazing new themes that this app has gotten for you. It’s no big deal, Real-Time Forecast Weather App works like a pro, just 28MB, obviously the highest installation size so far. This app has already been updated recently, so you can be assured that there are no bugs or Ads, totally free and free from some annoying Ads. Get your stylish, cool weather background designs with beautiful colours. over 50 million Android users have downloaded this app and used it and can testify that it is really good, don’t be left out, click the download link now and download this amazing weather app for just 26MB. Get ready to receive heavy weather alerts and forecast, and weather forecast from other countries around the world. So, if you are planning to travel to any part of the world, you can use this app to check and see the temperature and humidity and the rest, even before stepping one foot out of his rope. So, this is the final free weather app on my list, too bad I didn’t save this for last. This weather app is one hell of an app, but it is nothing compared to the weather app that I have on my list above. A free weather app that has a lot of widgets. You can customize those widgets and change the background to look like whatever you want it to be. Yea! weather apps will be draining your battery just a little bit, but if you are using an Android device that has good battery life, you got nothing to worry about. You also need a good and stable internet connection. For another Smartphone, the settings of this app might change, so us a familiar smartphone like Samsung or Htc or all other Android devices. There really isn’t much to say, and I’m not one to waste words, just click the download link now and get your Simple Weather & Clock Widget App. This app is 7.5MB in the installation size. The Best Free Weather Apps For Android that you have enjoyed from my list is simply amazing, no other weather app out there can match up to this 10 Best Free Weather Apps For Android. In setting a weather app, your location is very important, never forget, it’s literally one of the first things you will be asked by the app to do to have the app working fully. So anytime you need some guidance on what the weather condition might look like tomorrow, try out one of my 10 Best Free Weather Apps For Android, they are all top-notch. Thanks for stopping by, but I have to go now, till next time, bye. previous 10 Best Equalizer Apps For Android | Get Equalized!! !